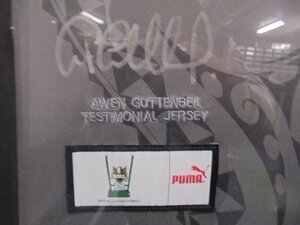 Known as the Awen Guttenbeil Testimonial jersey. 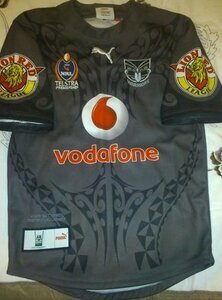 This stunning one-off Vodafone Warriors jersey was produced by Puma for Guttenbeil's testimonial match against Cronulla at Mt Smart Stadium on August 5 2006. Only a limited number were manufactured. The design featured the work of renowned moko artist Inia III of Moko Ink. Only 30 were ever made with 25 of them going for auction via a silent auction at Awens Testimonial Dinner. 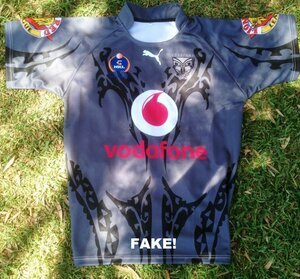 This jersey was the inspiration behind the CCC produced 2010 Heritage jersey. On closer inspection theyre a lot different in terms of the tattoo design. Possible due to a copyright issue. Theres a side by side comparison in the image gallery. 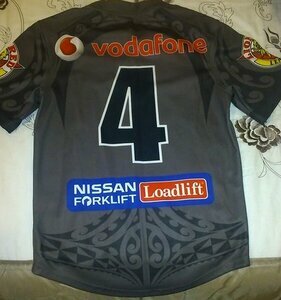 PLAYERS JERSEY - Only type available. 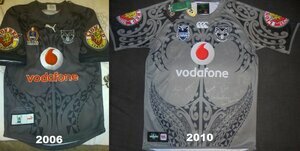 Player issue or match worn. None were offered for retail sale at all. 25 were auctioned but Im unsure what happened to the other 5. The club have one hanging up in the Stacey Jones Room where the team do video analysis. Obviously Awen would have been given his. 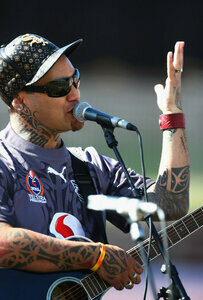 Another one was given to Tiki Tane when he performed for the Sonny Fai Tribute game in 2009.